Cut the bread very nicely, crust and brown, but do not harden it; cut the cheese rather more than half the thickness of the bread. Put it into the cheese-toaster, rubbed with butter, with boiling water under; stir the cheese, to prevent its burning. 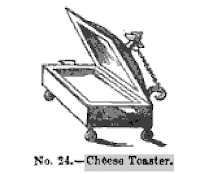 There are silver and white tin cheese-toasters, filled with small pans, for dividing the cheese. if mustard is liked, spread it in the inside of the crusade, which makes it a Welsh-rabbit. Toast some slices of bread, (having cut off the crust,) butter them, and keep them hot. Grate or shave down with a knife some fine mellow cheese : and, if it is not very rich, mix with it a few small bits of butter. Put it into a cheese-toaster, or into a skillet, and add to it a tea-spoonful of made mustard; a little cayenne pepper : and if you choose, a wine glass of fresh porter or of red wine. Stir the mixture over hot coals, till it is completely dissolved ; and then brown it by holding over it a salamander, or a redhot shovel. Lay the toast in the bottom and round the sides of a deep dish; put the melted cheese upon it, and serve it up as hot as possible, with dry toast in a separate plate; and accompanied by porter or ale. Double Gloucester is also a cheese in great repute, and if made at a good dairy is in prime order from nine to twelve months. This makes an excellent Welsh rarebit, and is capital for a stew if carefully kept in a cheese-toaster. Single Gloucester, which, when successfully made, is of a fine delicate flavour, is generally used at the taverns for a Welsh rarebit. It is fit for table in five or six months. Derby cheese, however, when from the best dairies, being of a delicate flavour and agreeable texture, is preferred to all others by the cognoscenti for toasting. A Welsh rarebit, capitally cooked, of Derbyshire cheese is served with eclat at the best appointed tables.